At Linens, Things and More…, we know the importance of perfecting every single detail of your destination wedding décor. Our wedding and event designers consider everything about your style as a couple and make sure your décor reflects your unique personalities. Your entrance table is a perfect opportunity to share your individual style with family and friends as they arrive to your cocktail or reception area. The entrance table is also an important element of every reception set-up, because the table provides a seamless transition from your ceremony to your cocktail hour and reception. Each guest at your reception will feel welcome right away when they see your wedding flowers in a beautiful arrangement on your entrance table. 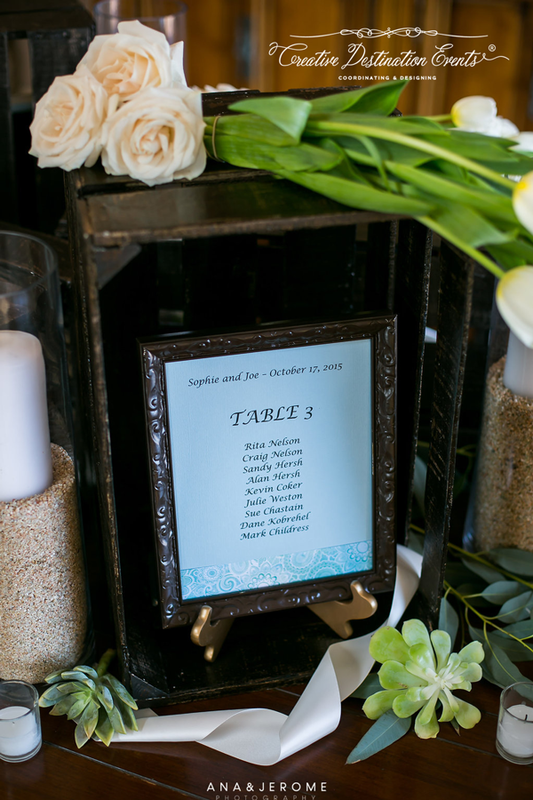 A personal message or simple hand-lettered sign displayed on the table can lead your guests in the right direction when it’s time to take their seats. 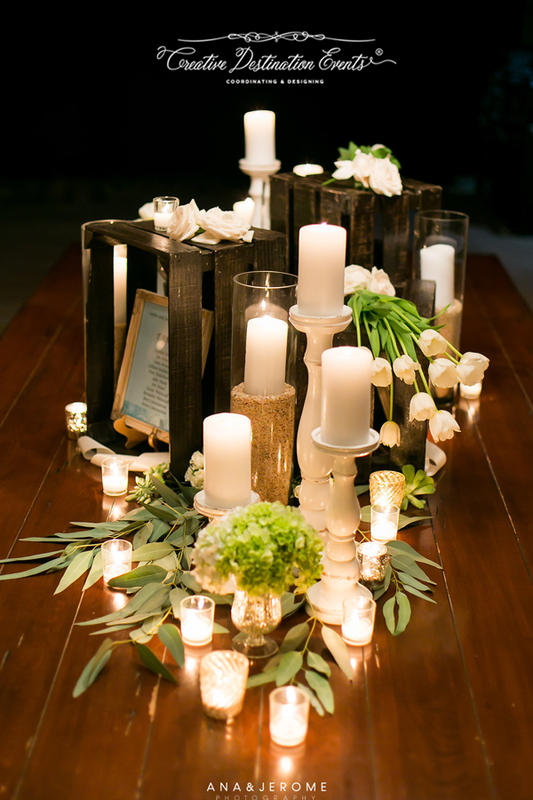 Candles and floral arrangements create a special look that ties into your overall wedding theme. Little touches like personal photos truly help tell your love story to everyone who stops by to sign your guest book or find their seating card. A perfect entrance table is stylish, unique to you and your partner, and communicates all the details your guests need to celebrate your special evening. Linens, Things and More…can help you take care of your entrance table decor and so much more! Contact our event design team today to learn how we can dress up your special event in Los Cabos! This entry was posted in Weddings and corporate events decor and tagged A Matter of Taste catering, Cabo beach wedding ceremony, Cabo event design, CABO FLORAL STUDIO, Cabo private villa reception, Cabo villa reception decor, Cabo wedding details, Cabo wedding entrance table, Cabo wedding on the sand, Cabo wedding rentals, Caob wedding design, CREATIVE DESTINATION EVENTS, entrance table ideas, Mexico wedding decor, personalize Cabo wedding. Brittney & Jared Light – 7th Noviembre 2015 at Villa Bellissima.